A night of fun and craic where everyone becomes a “poor farmer” for the night! The 14th Annual Poor Farmers Association (P.F.A.) 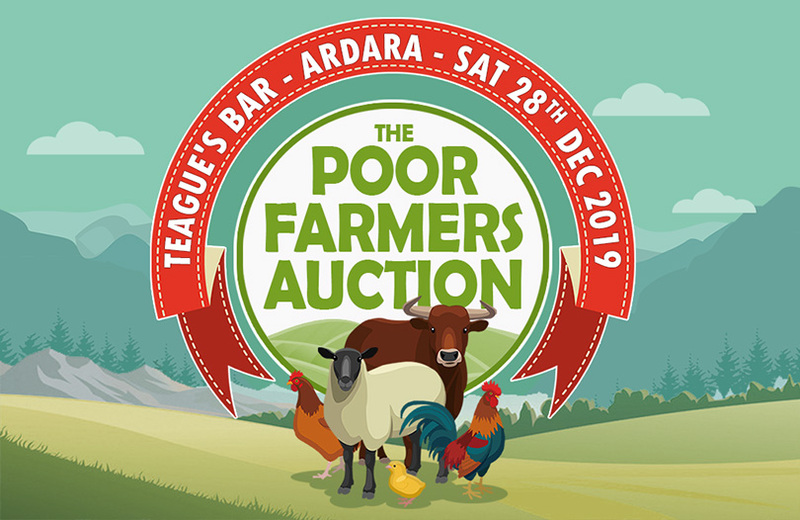 Charity Auction takes place in Teague’s Bar, Ardara, Co. Donegal on Saturday the 28th December 2019. The P.F.A. auction will be a great night’s crack as usual. Furniture and fixtures are removed from the bar and replaced with bales of straw to sit on, with saw-dust covering the floors. The stage is also transformed into a bidding table for the auctioneer taking charge of proceedings over the usual dance floor which also morphs, on the night, into “the mart ring” with livestock auctioned in bar. In the past, lots have included sheep, heifers, bags of turf, chickens, gates, bags of nuts and bales of silage to name but a few.